Surprisingly, there are no authoritative books giving an overall introduction to energy for general readers, students, engineers, geographers or architects, offering adequate coverage of the scientific, engineering, environmental, social and economic dimensions in a single, reasonably-sized and easily-readable volume. This book seeks to fill that gap. 1 Energy: all that matters? 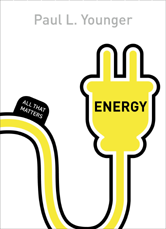 2 No, really: energy is matter! 8 Secure, green and cheap energy: can we really have it all?